On 17 May, William Broad’s piece, “In Taking Crimea, Putin Gains a Sea of Fuel Reserves”, appeared in the New York Times. Broad explained how the annexation of Crimea by Russia changed the legal claims for exclusive access to the maritime resources for the littoral nations of the Black Sea and the Sea of Azov. At the core of the change is the 200 NM exclusion zone promulgated by the Law of the Sea, 1982. Typically for the Grey Lady, Broad spun this fact into an anti-Putin tapestry using a charged mix of verbs, adjectives, and adverbs. Nevertheless, Broad’s report contains tantalizing information that hints at a fascinating alternative explanation for the events leading up to the Crimean annexation. The facts in Broad’s report appear to come almost entirely from an interview Broad had with Dr. William B. F. Ryan, a marine geologist at the Lamont-Doherty Earth Observatory of Columbia University, including the maps showing each littoral country’s Law of the Sea exclusion zones. Ryan’s facts are not in dispute. A point not mentioned by Broad is that no geographic location in either the Black Sea or the Sea of Azov is more than 200 NM from a coastline of the six littoral nations — Russia, Ukraine, Romania, Bulgaria, Turkey, or Georgia. This can be seen by superimposing the 200 NM scale on the map below (Figure 1). The overlap of all the “exclusion” zones covers 100% of both seas, with the six areas divvied up according to the separation rules codified by the Law the Sea. 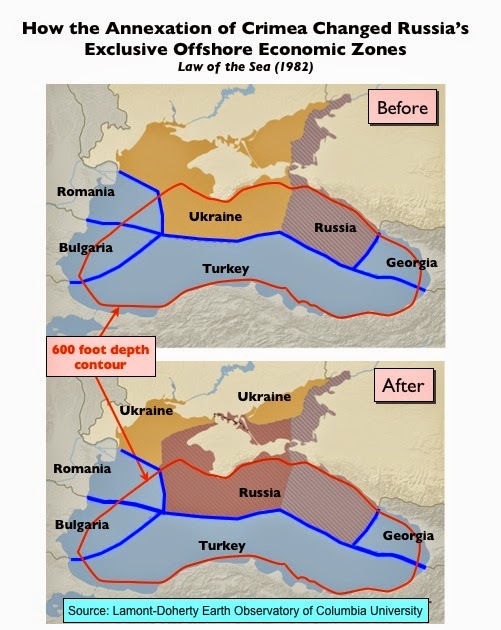 The extensive overlap means that the change in the Ukraine-Russian border produces a profound shift in the exclusion zones belonging to Russia and Ukraine, as shown in Dr. Ryan’s before and after maps (Figure 2 below). 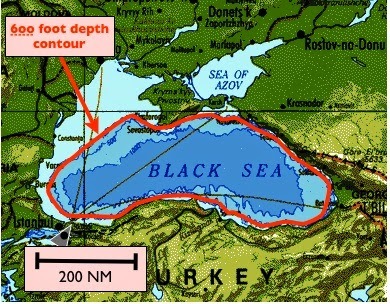 The division of exclusion zones in the Black Sea is a big deal, because many geologists believe the floor of the Black Sea, like that of the North Sea, contains massive reserves of oil and gas, especially in deep water. We have added the 600 foot depth contour in red on Figure 1. This contour marks the beginning of the medium blue transition zone between the shallow coastal shelf waters and the deep sea waters outlined by the 6000 feet contour enclosing the deep blue area in Figure 1. (note: the contour lines in Figure 1 are in fathoms; 1 fathom = 6 feet.) With the exception of the northwestern portion of the Black Sea, coastal waters with depths of less than 600 feet cover only small distances from the national coastlines. Now let’s turn our attention to the exclusion zones. The Ryan maps in Figure 2 break up the Black Sea and Sea of Azov into the six exclusion zones introduced above. They show how Russia’s annexation of Crimea did not change anything for Romania, Bulgaria, Turkey, or Georgia. According to Ryan’s maps, the annexation of Crimea added 36,000 square miles, more than doubling Russia’s legal claims from 26,000 square miles in the Black Sea and Sea of Azov to 62,000 square miles. Ukraine lost a corresponding amount. More importantly, the overlay of the 600 foot contour shows that Ukraine no longer has access to any deep water. This change is a verifiable consequence of annexation. And it has profound implications. Dr. Ryan also speculates the deep regions gained by Russia may be “the best” of the Black Sea’s deep oil reserves, although it must be remembered these reserves are not fully explored. In fact, as of 2012, less than 100 exploratory wells have been drilled in the Black Sea’s deep water, and only one well has struck pay dirt. That well, “Domino 1,” drilled in Romanian waters at a depth of 3200 feet, lies beyond the 600 foot contour line near the NE edge of the Romanian exclusion zone, close to what is now the Russian exclusion zone. So, at first glance, it is easy to accept the picture slyly suggested by Broad’s charged verbs, adverbs, and adjectives: the annexation of Crimea by Russia was, at least in part, an aggressive energy grab by the Machiavellian Russian chess master, “Vlad the Bad” Putin. Such a conclusion is certainly comforting to those in the US neoliberal establishment intent on starting a new cold war and grabbing control of even more state property of the former USSR via privatization, austerity economics, and good old fashioned bribery. But putting aside the tendentious verbiage, there are facts in Broad’s reportage that suggest quite a different picture. Note Broad’s several references to Exxon’s involvement and investment in Ukraine during 2012. Does this not raise the possibility that the US and EU-inspired putsch in Ukraine may have been allied with the lust of western oil and gas multinationals for a stranglehold on European energy supplies? If so, the figures compiled by Dr. Ryan may show how that coup blew up in our face. To fully savor the possible dimensions of a US-EU-Exxon screw-up, let’s look at a chronology of the recent, none-too-subtle moves on the EU-Ukraine-Russian chessboard. The EU started openly pushing Ukraine for a really raw, exploitative trade deal in March 2012. A month later, in April 2012, Putin signed up with ENI-Italy to explore Russian Black Sea oil/gas. In August 2012 Exxon put up big bucks to outbid Russia’s Lukoil for exploring Ukrainian Black Sea oil/gas (a deal crucial to Exxon’s breaking of Russia’s stranglehold on gas supplies for Europe). Over the next year, Yanukovych (no doubt convinced by massive contributions to his Bahamian bank accounts) pushed the Ukrainian parliament to pass all the laws required to meet the EU/IMF’s draconian austerity requirements. (see Michael Hudson’s “New Cold War Ukraine Gambit” for an explanation of neoliberal looting economics.) When it looked like he might succeed, Putin quickly imposed the gas/trade embargo on Ukraine in August 2013, starting a precipitous drop in the Ukrainian economy–and Yanukovych started backing away from the EU deal. That’s when the EU-US-EXXON made their monumentally stupid move of unleashing the coup against Yanukovych, beginning with the November 2013 Maidan protests leading to the neo-fascist incited riots that ended in the coup of 27 February 2014. The US-EU inspired coup, of course, gave Putin the perfect opening to welcome the grateful Crimeans back into the Russian fold–thereby swelling Putin’s domestic approval ratings enough to keep him in power for the next ten years. (For a good analysis of how Putin may view the world, see Mark Ames’ analysis of how he is exploiting the politics of resentment in Russia, Nixon-style.) And, perhaps not coincidentally, welcoming the grateful Crimeans also happened to more than double Putin’s Black Sea oil/gas holdings, while ruining Exxon’s chances for breaking his stranglehold on European gas supplies. Putin certainly isn’t the greatest European strategist since Bismarck. But it doesn’t take much to win when opposed by dumb, ultra-greedy opponents guided by the arrogance of ignorance. All Putin needed was seeing one tiny move further ahead. The only thing dumber than the transparent US-EU-Exxon moves was the American and European media’s slavish coverage of the same. Pierre M. Sprey, together with Air Force Cols John Boyd and Everest Riccioni, brought to fruition the F-16; he also led the design team for the A-10 and helped implement the program. 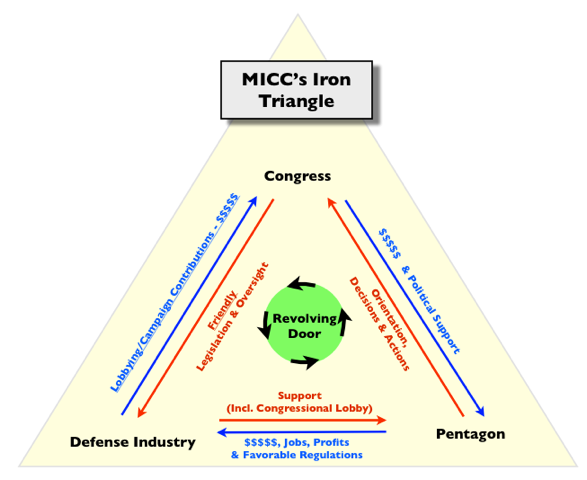 He is one of a very small number of Pentagon insiders who started the military reform movement in the late 1960s.